Серия SIC-W-R3 применяется для охлаждения форм, которые снижают продукцию цикла формования, также они доступны для охладительного оборудования в целях поддержания нормальной температуры. Кроме того, они подходят для других отраслей промышленности при необходимости охлаждения. German-made twin screw compressor with longer service life. 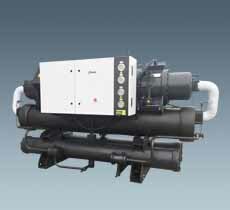 Stepless compressor output capacity adjusting function are designed to save power. Extendability of the controller makes upgrade of both hardware and software much easier. "Watchdog" technology makes microprocessor able to automatically diagnose and solve the problems. Based on serial number, frequency and times of faults, the causes can be analyzed via both query and statistics functions to do the improvements. Able to monitor the setting of actual temp. and display temp. trend in hours or daily. Remote control function turns on/off the machine according to preset timer,daily maximum setting of Start/stop is there.